some great stuff coming up. Monday evenings at Colchester Arts Centre (tel: 01206 500 900), doors 7.45pm. Click here for directions to the venue. See individual listings for prices. MEMBERSHIP valid until March 2009. 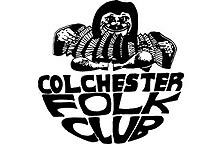 For �(� per couple) you are admitted to COLCHESTER FOLK CLUB at discounted members' rates on production of current MEMBERSHIP CARD. 13th September Les Barker Something of a cult figure with his unique brand of humour and witty poetry-scintillating daftness, absurdity run amok! 1st November Michael McGoldrick and Friends A welcome return! Michael is a master of the flute, whistle and uillean pipes and a founder member of Flook and Toss The Feathers. He currently plays with Capercaillie and Sharon Shannon as well as his own band. Tonight he抣l be playing material from his previous and current albums and will be joined by some of the top names in folk music. Be prepared for a stunning night. 29th November Tom McConville and David Newey . Scintillating fiddle, a silky smooth voice, a wide grin and a dry Geordie wit-and that抯 just Tom! Add David on guitar and a good night is guaranteed. Tom was voted Musician Of The Year at the 2009 Folk Awards. 20th December Christmas Barn Dance with Itchy Feet and caller Elaine Barker Our usual Christmas Barn Dance with experienced band and caller to guide you through the moves. Cloggies卆nd mince pies. Happy Christmas! club regulars & support artists.